What is 'Past In Different Ways?' Well, it's Michael Kiske re-recording Helloween songs in a new stripped down form. The songs come from Helloween's 'Keeper Of The Seven Keys - Part 1,' 'Keeper Of The Seven Keys - Part 2,' 'Chameleon' and 'Pink Bubbles Go Ape.' Also included is a new song 'Different Ways.' Kiske easily strips away the power in the power metal and gives us acoustic versions of his selections. Many times the guitar work sounds like Spanish guitar. Helloween goes flamenco? That's weird. There are even horns (or maybe the synthesizer version of horns) on songs like 'We Got That Right.' 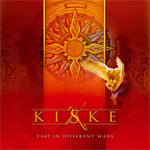 As I listened to 'Past In Different Ways,' I found myself unusually interested and somewhat pleased by Kiske's new interpretations. Frankly, I was quite amazed at his vocal abilities within this context. However, after awhile things seemed more than a bit creepy. It seemed strange to listen to Helloween in this way. 'Past In Different Ways' is like easy listening Helloween or better, a castrated Helloween. Honestly, I don't know what to conclude about Kiske's 'Past In Different Ways.' On one had it was interesting, but on the other hand it was disturbingly unnecessary. But, you know, I still liked. It's like a major conundrum. Love it or hate it, 'Past In Different Ways' will do one of several things: mystify you, bore you, or enrage you. Good luck in your interpretation: you'll need it. Michael Kiske's 'Past In Different Ways' is essentially stripped down interpretations of Helloween songs. He's made them acoustic driven numbers devoid of power. The work is unusual and hard to interpret. Yet, I found it strangely enjoyable.